Chicken livers are packed full of nutrients, are low in fat and are really quick to cook. What’s not to like? I know some people are a little put off by the thought of eating offal or maybe just think it looks a little unappetising. Ok, it doesn’t look pretty, but I assure you it more than makes up for it in taste. It also offers very good value for money compared to other meats available nowadays. I think offal is seriously underrated and after the enjoyment of this recipe I will definitely be buying chicken livers and other varieties, such as calves and lambs liver, as well as kidneys, more often. This recipe was inspired by a seven-spice chicken liver dish I had at Dock Kitchen, run by the hugely talented chef, Stevie Parle. I haven’t used seven spices here but simplified by using cumin, all spice and black pepper – enough of each to give a serious taste punch. 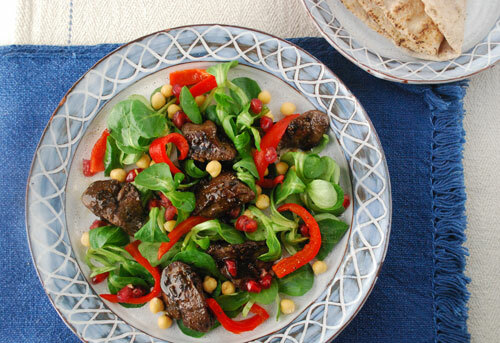 The sweetness of the pomegranate seeds and freshness of the salad offset the rich spicy chicken livers perfectly. It really is a super quick meal to prepare so definitely one to enjoy in the week when time is poor but you crave a healthy but satisfying meal. Great served with warm flatbreads and hummus as a side if you’re feeling particularly puckish. Firstly, prepare the chicken livers. Using some kitchen scissors and cut away any green bits or sinew or they will taste bitter. Cut into as even sized pieces as possible. Season the chicken livers with salt. Heat a large frying pan with 1 tablespoon of the oil over a medium heat until hot, add the livers and fry for about 2 minutes on each side so that they are brown and caramelised. Any smaller pieces will take less time to cook so remove these earlier. The livers should be cooked all the way through but still pink in the middle. Rest the livers on a warm plate while you make the dressing. Put the red wine vinegar into the same pan and bubble for 5 seconds seconds before adding the rest of the oil and then the spices. Stir the pan and cook for about 30 seconds, add the pomegranate molasses and any juices from the chicken livers, give the pan a swirl to combine and then remove from the heat. Arrange the lamb’s lettuce, red pepper, chickpeas and the livers on plates. 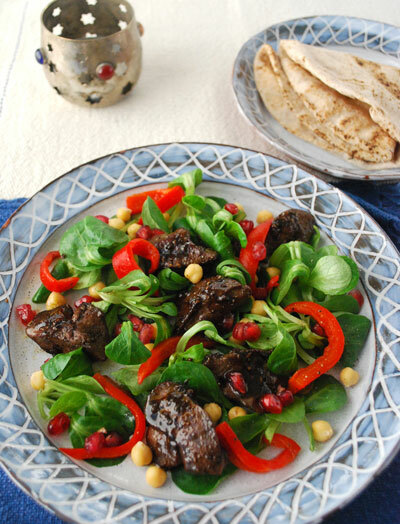 Drizzle the sticky dressing over the livers, sprinkle the pomegranate seeds over and serve. This entry was posted in Meat, Salads and tagged chicken livers, chickpea, lambs lettuce, pomegranate, spiced chicken livers on 25/01/2013 by Val McArthur.